Donors, special guests and members of the UCLA men's and women's basketball programs gathered Thursday evening to celebrate the grand opening of the Mo Ostin Basketball Center, a new, state-of-the-art practice facility. Participants included UCLA Chancellor Gene Block, director of athletics Dan Guerrero, head men’s basketball coach Steve Alford, head women’s basketball coach Cori Close, Bruins great Ann Meyers Drysdale and Mo Ostin, the former chairman of Warner Bros Records and UCLA graduate who committed $10 million to the project. The new center provides the men’s and women’s basketball teams with vital resources, and also frees up facility access for other programs and student-athletes. 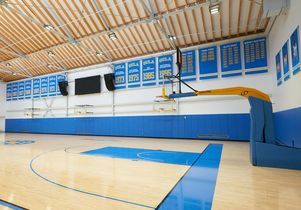 With approximately 35,000 gross square feet of space, UCLA’s practice facility stands near Pauley Pavilion’s southwest corner, along the south end of the Los Angeles Tennis Center and adjacent to the newly-constructed Wasserman Football Center. 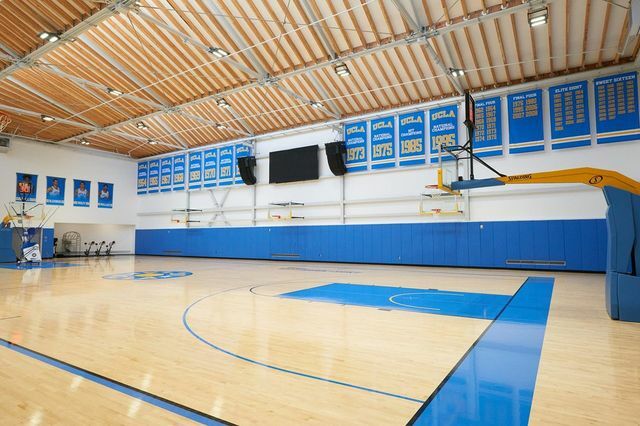 “The Mo Ostin Basketball Center is truly a commitment to upholding the prestige of UCLA Basketball, and as I indicated earlier, our student-athletes will be able to benefit from this facility for years to come,” Guerrero said. More at the UCLA Athletics website. Previous Story Former poet laureate Juan Felipe Herrera receives UCLA Medal Next Story Broad array of UCLA community members advocate to elected officials in downtown L.A.